A double stuffed trumpet with green markings on the outer petals. Green markings all over the place actually. 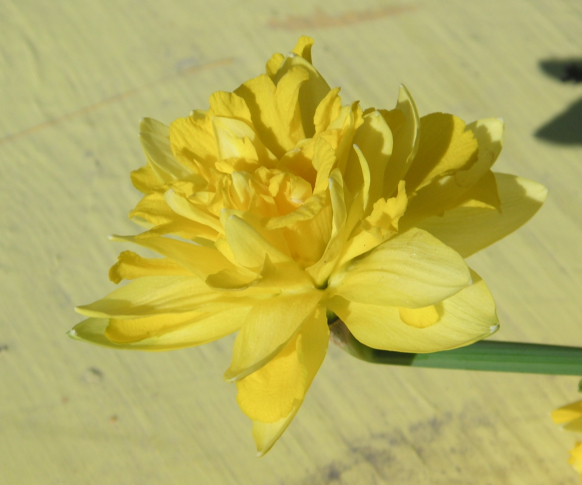 America's most traditional idea of a daffodil. Super stuffed trumpet with frill petals that uniformly break at an angle half way down the trumpet. The tips of the petal leaves are transparent. This transparency occurs on a number of different flowers to one extreme or another. A double stuffed trumpet with clean lines and no frills. This flower makes me laugh, it looks like a puppet face. Its spades break out at an angle half way down the trumpet. Rare freak of nature. Found at the far edge of an isolated bunch. Cream white petals, traditional trumpet, simple. I would say it is of the same variety as seen at bottom, but for they bloomed early and their isolated location. This is a dainty flower, whereas the one at bottom is a more meaty flower. 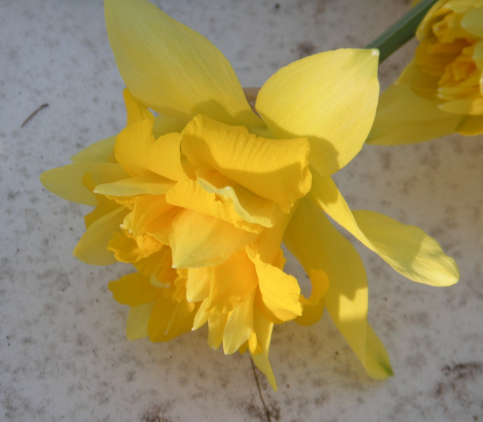 A double fluff with little or no trumpet, cream spades and cream outer petals	. Similar to one at right. A double fluff with no trumpet to speak of, virually all yellow. 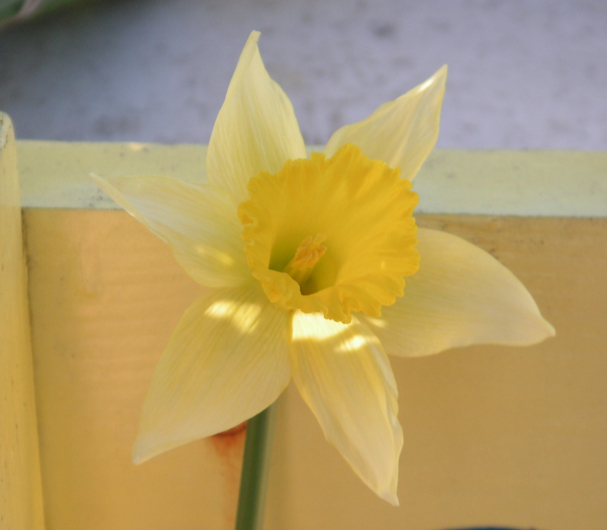 A fountian of a daffodil if ever I saw. Has green spades outside and cream spades in the trumpet. Amazing bloom. A chandalier design very similar to a snowflake. Super fluffy inside, reserved outside. 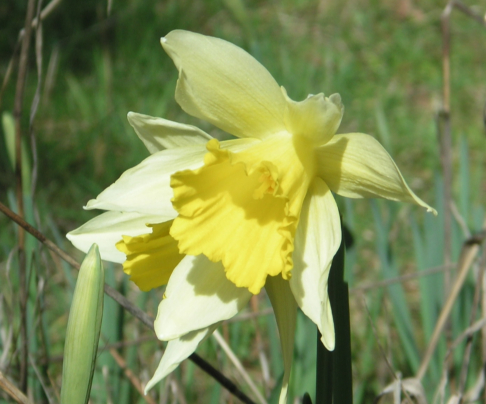 Variation on the snowflake design, hard to see, but has a super slender turmpet of gold with cream spades surrounded by yellow frill, cream spades, yellow frill, cream outer petals. Bizarre. Another variation on the slender trumpet design. 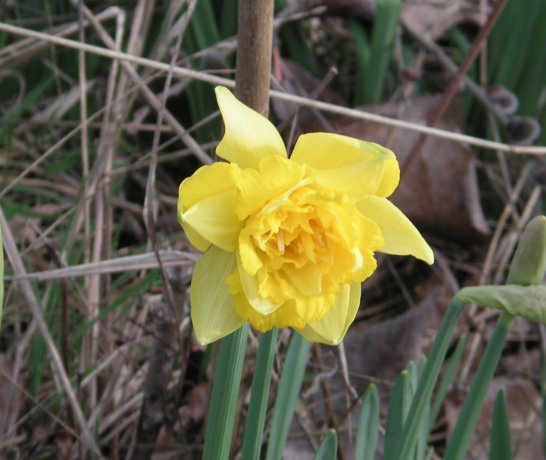 An overstuffed fluff of a daffodil. 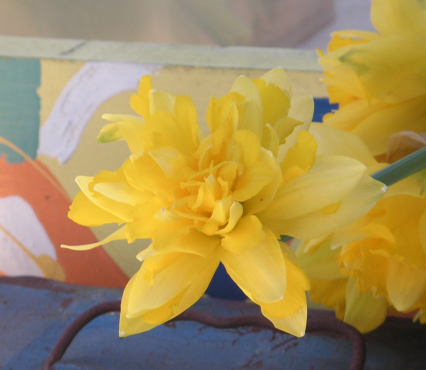 Yellow all over, pail cream spades. 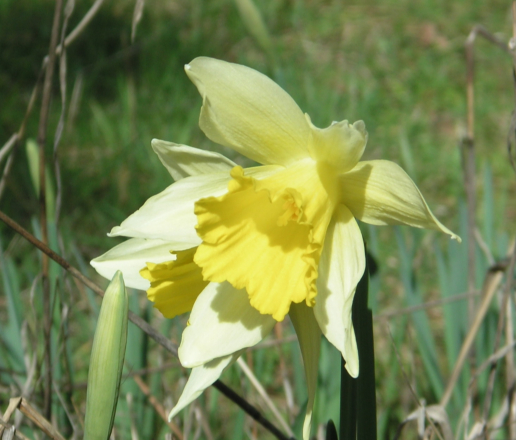 A nice snowflake of a daffodil. Full splits all the way through. A King Alfred I believe. Super large and luscious flower. Double fluff trumpet with odd creamy spade petals jutting out like daggars evenly spaced from the trumpet to the frill petals. Crocodile in rain on the last day in February. Still too cold to warm up and smile. Nice six sided snow flake, complete splits all the way to the center. Two sides of the same flower. They could be two completely new varieties, but they are a morph gone twisted. I found these along Cornelius pass road. A long forgetten and abandoned pile of daffodils dating back to the 19th century. I pulled 2500 bulbs from that spot. A double fluff with no trumpet to speak of, virually all yellow. Very similar to snowflake just above, but slightly different. 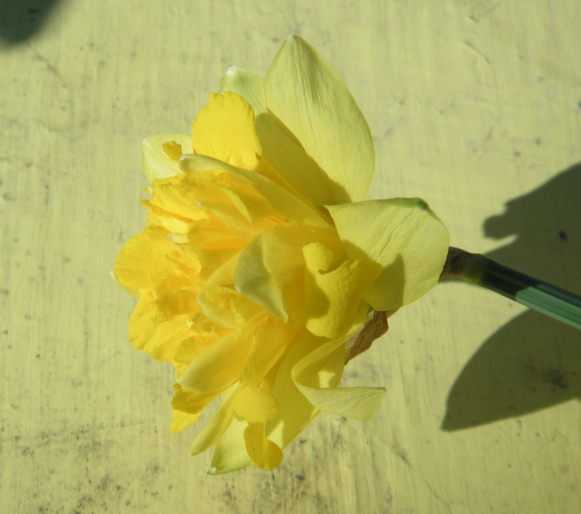 Illustrates the subtle variations the daffodils have hybredized into. A very showy flower this one. 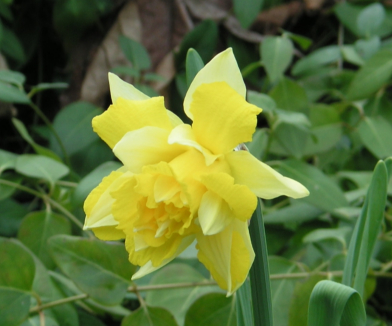 Similar to flower above, but trumpet is far more luscious and hybredized looking. 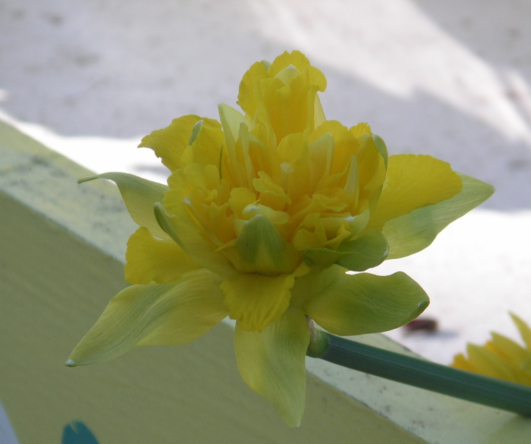 This is my entire collection of mini daffodils. Because they don't make long stems, and because I don't have 300,000 bulbs, I probably won't obtain more. Unless I am offered someones collection for a fraction of their value. Similar to a snowflake design. the petals almost look like they have transparent tips, though I think it is more likely coloring from the green that spreads into the bloom in mystereous ways. Clearly defined double stuffed trumpet (though splitting into a snowflake) with sun pedals making up the rear of bloom. This flower looks kind of flat. It is the same as the others, but the angle makes it look more flat than the others. 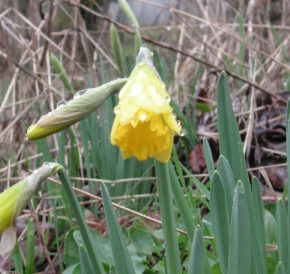 These two photos are of the same variety of daffodil. I particularly like the drops of water on the petals. Another example of the slender trumpet affect. 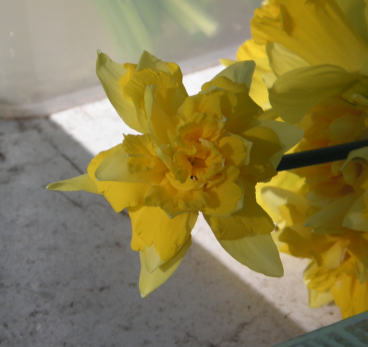 Narcissus. These smell very strong and bloom multiple blooms on one stock. I have a very small collection of these. A nice example of the cream spades jutting out from the overstuffed trumpet. The drops of water sit on the petals like rindstones. 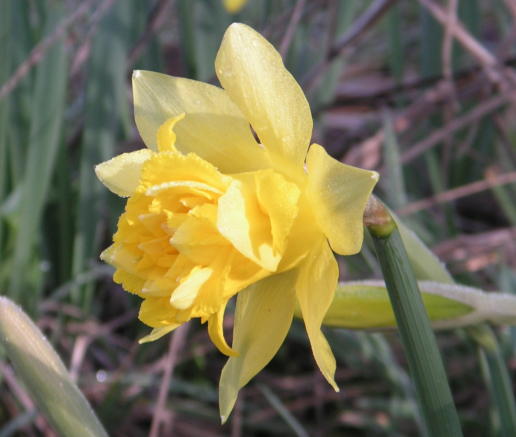 Beautiful example of the double stuffed daffodil. Completely white with an orange/pinkish stamen. Only two of these bloomed this year. This one seen here is the one that didn't fall victem to a slug. Creepy how ghostly white they are. I like the form of this flower. Slender and tight with cream spades pushing out the front. 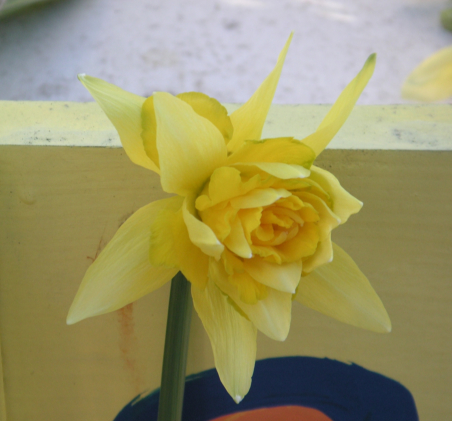 This is a slightly mutated example of this flower. I pulled about 1400 bulbs of these out of a front yard where the house was being sold. I got permission first, but only was able to dig 1400 bulbs. Within two years the front yard had been rototiller and almost all the bulbs were pulverized. Tens of thousands of these were killed in one afternoon. Nice frilly double stuffed flower. Clean straight double stuffed trumpet. Cream spades pushing out the front. The spades and frill on this bloom are so distinguished from one another that the petals take on something of a feather look. 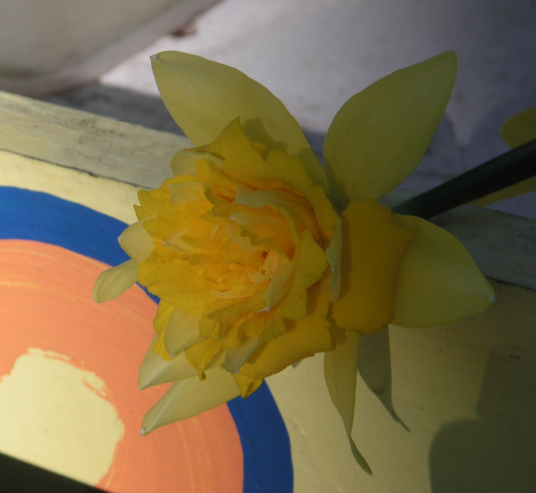 The sun petals are washed out cream in color with shoots of green streaking over the bloom. Amazing bloom. Mom picked it, so I'm not sure what bulb it came from. I have that section of the field marked for next year. The trumpet is starting to split into frill, but not quit yet. 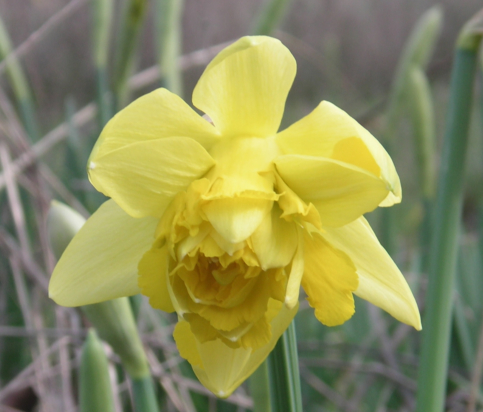 The trumpet of the daffodil naturally has frill around the lip. 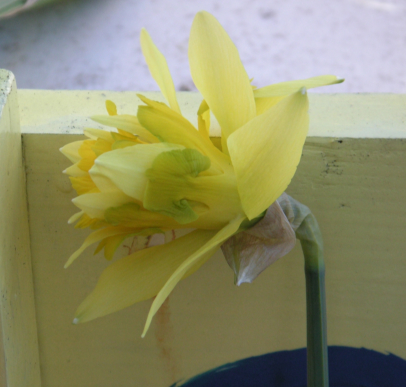 The frill osilates up and down to some small degree, but this bloom shows the osilation having split and dipped all the way to the base of the bloom. Very cool. 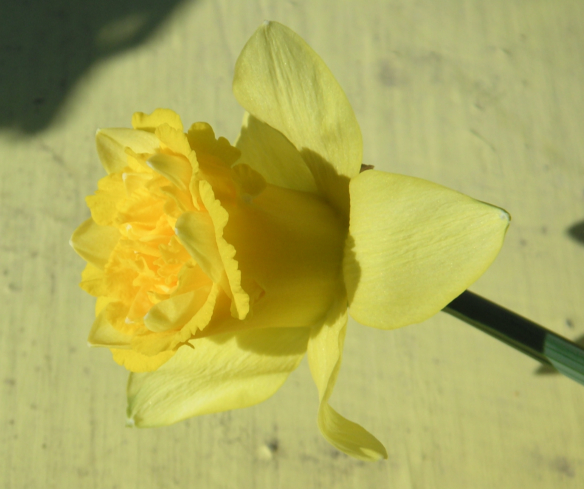 This flower has some real nice green and yellow striping. The number of flowers with some level of green bleeding throughout the flower is a lot. I stopped taking photos of every example I came across. The green bleed morphs the flower in all kinds of ways; not sure what the green is other than it probably comes from the mechanism that gets the stock to turn green. It sure seems toxic, it causes obvious mutations, though pretty mutations. Another amazing bloom, growing under a fallen oak branch. 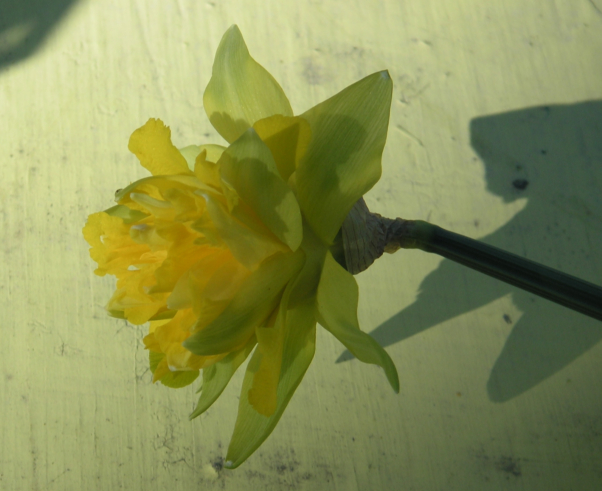 Green mutation on trumpet, curling back the frill, exposing a cream spade. Nice green edging on petals, very subtle. Two different sides of the same flower. Green all over, just amazing. Three differnt looks at the same flower. Has green edging like the other, but a solid green frill on the underside. These two flower were next to each other, yet slightly different. Both have some green yet one is tight, while the other has a blown open bloom.